This example shows how you can fit the REGCOMPONENT models in Bell (2011) by using the SSM procedure. The following DATA step generates the data used in the last example of this article (Example 6: “Modeling a time series with a sampling error component”). The variable y in this data set contains monthly values of the VIP series (value of construction put in place), a U.S. Census Bureau publication that measures the value of construction installed or erected at construction sites during a given month. The values of y are known to be contaminated with heterogeneous sampling errors; the variable hwt in the data set is a proxy for this sampling error in the log scale. The variable hwt is treated as a weight variable for the noise component in the model. 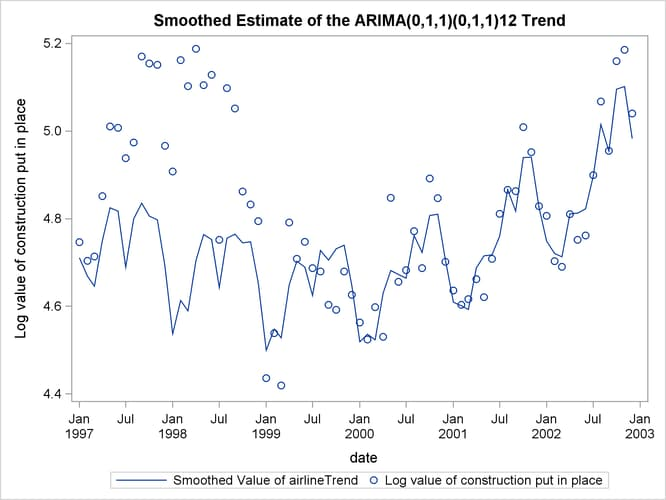 The ARIMA(0,1,1) (0,1,1) trend is named airlineTrend and the zero-mean, AR(2) error process is named ar2Noise. See the TREND statement for more information about the ARIMA notation. The estimates of model parameters are shown in Output 27.6.1. These estimates are different from the estimates given in the article; however, the estimated trend and noise series are qualitatively similar. The article uses an estimation procedure that consists of a sequence of alternating steps in which one subset of parameters is held fixed and the remaining parameters are estimated by MLE in each step. This process continues until all the estimates stabilize. The SSM procedure estimates all the parameters simultaneously by MLE. The following statements produce the plot of the estimate of the airlineTrend component (shown in Output 27.6.2). This plot is very similar to the trend plot shown in the article (the article plots are in the antilog scale). 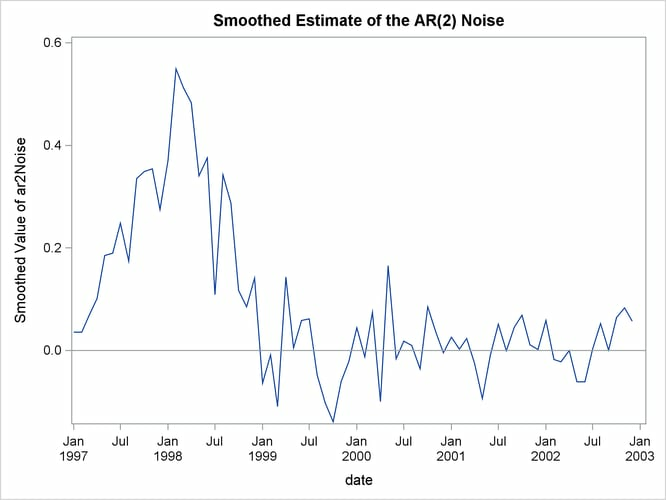 The following statements produce the plot of the estimate of the ar2Noise component (shown in Output 27.6.3). This plot is also very similar to the noise plot shown in the article (once again, the article plots are in the antilog scale).